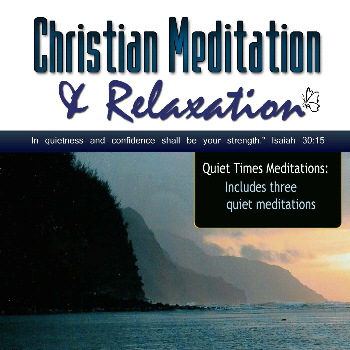 This QUIET TIMES Christian meditation CD contains three quiet meditations for centering prayer, contemplation, and dwelling in God presence. Each meditation begins with a progressive relaxation, followed by a Biblical narrative and relaxing background music. This is a great centering meditation CD for both beginner and advanced meditators. Centering meditations are effective for overcoming excessive thinking and distracting thoughts. Unlike my other CDs, it allows you to meditate to nature sounds (forest, rain, and ocean) and each meditation contains a progressive relaxation exercise and only a brief narrative. After that you focus on the spiritual anchor in tracks 2 or 3, or create your own in track 4. Instructions included in introduction. 3. Listen to the ebb and flow of the ocean as you repeat the spiritual phrase of your choice. Wow is all I can say. Your Christian Meditations are a God send. Your voice is so calming, so sweet, and so reassuring and the messages and how you present them is definitely a gift God has given you to help people like myself. The last three years of my life have been a struggle and I feel like God led me to your site. I wanted to find something Christ centered to help me with my anxieties and health issues stemming from grief and anxieties. Thank you for answering God’s call and doing his work. Every time I listen to your Christian Meditations I feel like you are my friend helping guide me into God’s presence. I wish I could afford all the Cds now but look forward to when I can. God will bless you in a special way for bringing his word and promises to others and I pray that for you. You are an amazing person. “–In Christ, Molly M.